UUC is committed to supporting our shared UU principles through action and service within our congregation, the local community and the broader world. To that end, we have a very active Community Service Team which supports several social action projects throughout the year. Contact the Community Service Team for more information about any of these projects. The Interfaith Food Pantry was formed as a cooperative effort of town churches including UUC. It serves over 800 clients a month with approximately $100 to $200 worth of food depending on family size and food availability. The children’s offering in our RE classes is currently donated to the Interfaith Food Pantry. 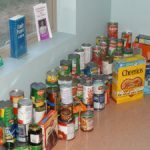 UUC also has several collections during services each year for the Pantry as well as members who volunteer to distribute food several times a month. UUC volunteers join with Habitat to help build homes in our community. 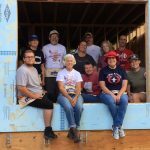 On July 28, 2018, a large group of volunteers spent the day building a new home in Christiansburg. See the Habitat Facebook post thanking our volunteers which includes a video slide show of the volunteers hard at work. Since 2000, UUC has partnered with other local churches in a program to provide temporary overnight shelter during the harshest winter months for homeless men in the New River Valley. Starting in fall 2018, shelter will be provided to homeless women also. Our role is that of a Support Congregation to the Host Congregations who actually house the men and women in their churches. We provide food, activities, and companionship for one to two weeks from Nov. 1 – March 31 each year. In addition to meals and a warm place to sleep, additional services, such as transitioning to more permanent housing and job counseling, are provided. Learn more. For the past many years, the Caring Network has provided short-term support for congregants in need of meals, transportation, and child care due to illness, surgeries, family difficulties, etc. To join this group of dedicated individuals or for their help, contact caring@uucnrv.org. Beginning in November 2010, UUC has been part of the Adopt-a-Highway program. We are responsible for litter pick-up on two miles of Rt. 460 in Christiansburg nears Lowes. 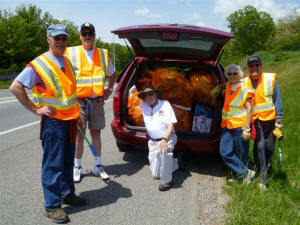 Members meet four times each year to keep our section beautiful. A survey in January 2007 showed that the environment was a primary concern for congregants. In response, the Green Team was formed and on November 12, 2012, UUC was approved as a Certified Green Sanctuary congregation by the Unitarian Universalist Association Office of Congregation Stewardship Services. Learn more about the Green Sanctuary Program. Beginning in 2015, UUC began giving ½ the basket offering away every single Sunday morning. This is an opportunity to practice generosity as a community on a consistent basis. It’s a spiritual practice in generosity, an opportunity to “live our values” and “walk our talk” as a congregation exploring what it means to live generous lives of care, and hope! Doing this together each Sunday is one powerful, visible, and important way we can make a difference in local, national and international communities. Learn more about the 1/2 plate recipients for 2019. Learn more about the 1/2 plate recipients for 2018. Learn more about the 1/2 plate recipients for 2017. A special collection is held during our Christmas Eve Service for this fund which is used by our minister throughout the year to help those in our congregation and wider community needing assistance with rent, utilities, food, etc. Donations can also be made at any time during the year to the fund. Recipients of these funds are kept confidential. UUC hosts a team to participate in the annual walk held in Blacksburg, this year on September 29. Held annually in more than 600 communities nationwide, the Alzheimer’s Association Walk to End Alzheimer’s is the world’s largest event to raise awareness and funds for Alzheimer’s care, support and research. Visit our team webpage. The Blacksburg Refugee Partnership was formed in the summer of 2016 to assist with the resettlement of refugee families who have come to the U.S. to escape war-torn countries. UUC is one of many participating local churches and businesses. Many of our members have joined the effort to help these families by providing childcare, English lessons, companionship, transportation, etc. UUC has also donated financially to assist the families. UUC members provide monthly donation of and delivery of treats for the children sheltered there. UUC members lead monthly bingo games for the residents. Several collections of needed items occur throughout the year. Some of this and past year’s collections are listed below. On all Sundays in November, the Community Service Team collects new children’s underwear and winter coats as well as clean, gently used children’s winter coats for the customers of the Christmas Store. If you wish to support this project, bring your contributions to UUC on one of the collection dates. Many members also volunteer to work at the Christmas Store in early December when qualified families and individuals “shop”. During the months of March and April, items are collected for our animal friends. These items are then used for our annual Easter Egg Hunt before being taken to HSMC. Donation boxes are both upstairs and downstairs. 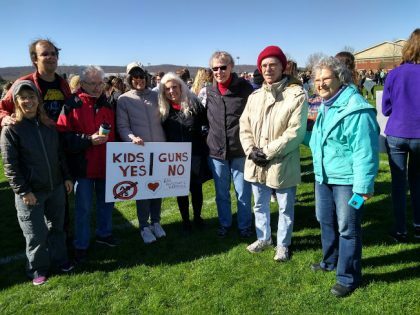 On April 20, 2018, members of our community gathered on the playing fields between Kipps Elementary and Blacksburg Middle School and stood hand in hand to protest the continued inaction on gun violence and to show our politicians that we’ve had enough of the horrific murders of our precious children and loved ones within our schools. Many UUC members were in attendance including Rev. Pam Philips. 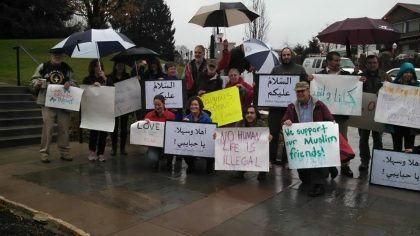 On December 23, 2015 many UUs and members of our community gathered in downtown Blacksburg holding signs for interfaith welcome and affirming dignity and respect for people of all faith traditions, particularly those practicing Islam. Several of our members joined then UUA President, Rev. 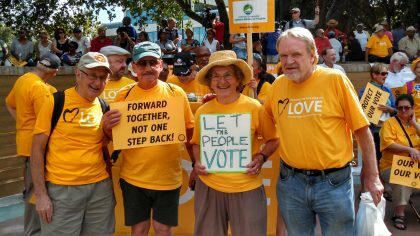 Peter Morales, and other UUs from across our Southern Region in Winston-Salem, NC on July 12-13, 2015 to stand for racial justice and the preservation of African American voting rights. There were teach-ins, workshops and gatherings culminating in a March for Voting Rights through downtown Winston-Salem. Read the letter from Rev. Morales. 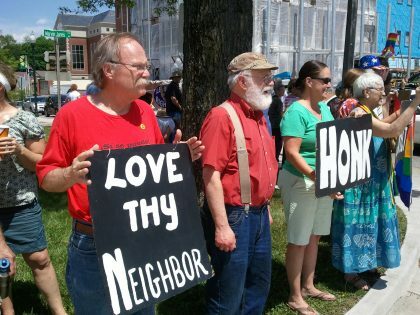 On May 12, 2014 over 50 people joined with Rev. Dara Olandt at the Montgomery County Courthouse in Christiansburg to show support of the day when all loving couples can legally marry the person of their dreams in our state! 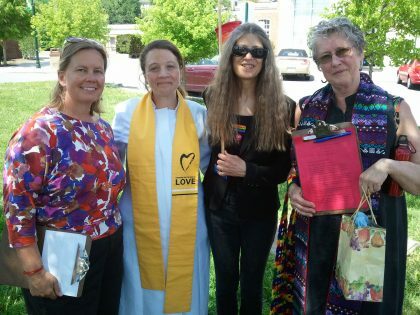 There was singing, interfaith prayer, personal testimonials, and a sharing of “love cookies.” A small contingent delivered a Love Letter to the county clerk indicating our support of Marriage Equality.